Surprise! I’m a Wisconsinite. What’s your regional dialect? A dialect is a form of language (including word choice and pronunciation) specific to a particular group. Social classes and ethnic groups can have varying dialects, but the term is most often used to refer to regional variations in language. That’s what today’s post focuses on. 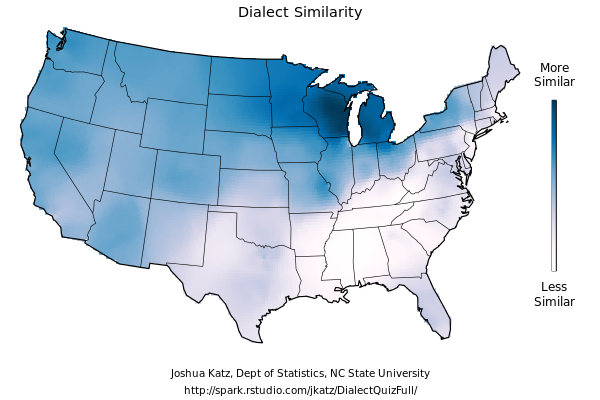 People are fascinated by regional dialects. In the past few days alone, I’ve seen multiple people posting about them on Facebook. I’ve done similar quizzes in the past, but I like the two that have been floating around recently. Indeed, I’ve spent most of my life so far in Wisconsin. In fact, on my first day of choir in college in Ohio, the conductor stopped us in the middle of a song to ask, “who’s from Wisconsin?” Apparently my Wisconsin accent shines through my Latin–even in another Great Lakes state. The second quiz is called “Where in the continental United States do they speak like you?” There’s a short version with 25 questions, but I took the full version with a whopping 140 questions. It was quite a time investment, but I love the output. The maps below show the likelihood that “a randomly-selected person in that [area] would respond to a randomly-selected survey question the same way [I] did.” The first is the full-color map, and the second is the monotone version for colorblind folks like my brother. The cities most similar to me are Green Bay, Milwaukee, and Madison, Wisconsin (58.9%, 58.7%, and 58.3% similarity, respectively). My entire family is from Plymouth, Wisconsin, which is halfway between Green Bay and Milwaukee, and I grew up in Madison. So that makes sense. Apparently Grand Rapids and Lansing, Michigan are also quite similar (58.2% and 57.7%, respectively). On the other end are New York, NY; Birmingham, AL; Huntsville, AL; Jackson, MS; and Yonkers, NY (48.4%, 48.4%, 48.5%, 48.5%, and 48.7% similarity, respectively). I think it’s interesting that these differences are so strong both on the East Coast and in the South. 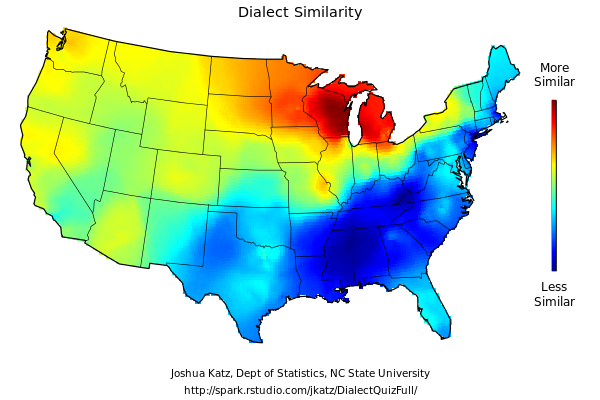 So where do these (or other) quizzes place your regional dialect? Are they as accurate for you as they were for me? This entry was posted in Blog, Language Miscellany on September 16, 2013 by Science Refinery (Lauren Meyer).